You need to sign in to create a shareable link. ArcGIS, QGIS or web apps can simply use this map with web map services. WMTS, TileJSON or XYZ tiles are provided for quick access to processed maps. Sign in to get links. Sign in to download GeoTIFF. 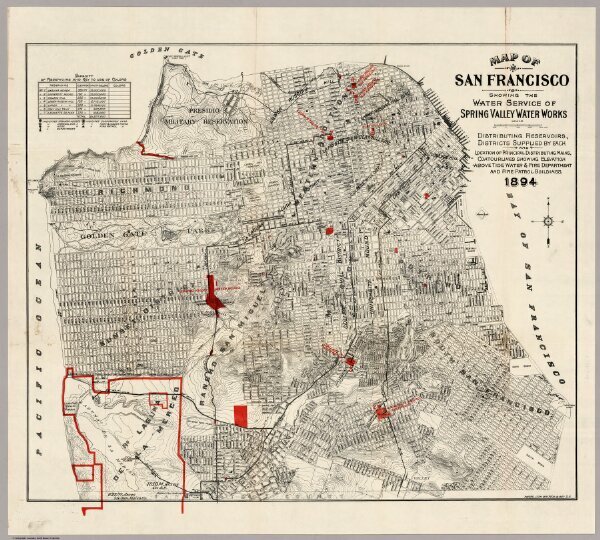 Map Of San Francisco Showing The Water Service Of Spring Valley Water Works. Distributing Reservoirs, Districts Supplied By Each And Location Of Principal Distributing Mains, Contour Lines, Showing Elevation Above Water & Fire Department And Fire Patrol Buildings. 1894. Photo. Lith. Britton & Rey, S.F.